A new wave of technologies, such as the Internet of Things (IoT), blockchain and artificial intelligence (AI), is transforming cities into smart cities. Many of these cities are building innovation labs and zones as part of their new civic landscape. Smart city innovation labs are vital components of the smart city ecosystem (Figure One). They provide an organized structure for cities, communities, experts, and vendors to come together to create solutions. Successful solutions piloted in smart city innovation labs are then scaled and deployed into a city’s operations and infrastructure. Figure One. 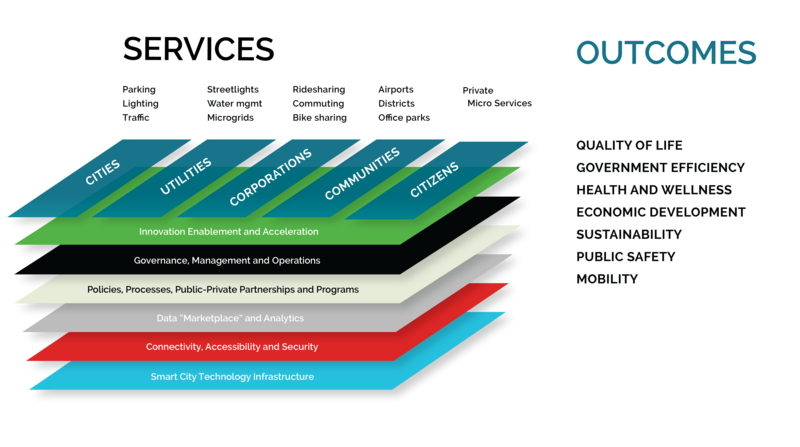 Strategy of Things Smart City Ecosystem Framework. Many municipalities are considering and planning smart city innovation labs today. Over the past year, we helped to create, launch and operationalize San Mateo County’s Smart Region innovation lab (SMC Labs). From this experience, we share ten best practices for civic innovation leaders and smart city planners. Develop a well defined innovation sandbox. Every smart city innovation lab has an unique mission. That mission is specific to its community, capabilities, priorities, and surrounding ecosystem. However, it is easy to get distracted and work on the “next shiny object”, vanity projects and “me too” innovation pilots. These projects don’t add value, but take resources and focus away from the problems the lab was created to address. Build innovation discipline and focus by defining a “sandbox” from the start and updating it annually. The innovation sandbox defines clearly what types of projects are in-scope and which ones are not. The criteria includes alignment with city or department priorities, problem set type, problem owner(s) or sponsors, budget availability, cost, resource requirements, and organizational jurisdiction. Create procurement policies and processes for innovation projects. Innovation pilots fall outside the “sandbox” municipal procurement processes and policies operate in. These pilots may work with start-ups with limited operating history, use immature and evolving technology, or bought in non-traditional ways (“as a service”, loans, etc.). This mismatch leads to higher risks, extra work and long sourcing times. Due to this, many vendors choose not to work with cities. Effective smart city innovation labs are agile and responsive. They employ new procurement policies and practices designed specifically for the unique needs of innovation projects. This includes simplified processes and compliance requirements, new risk management approaches, faster payment cycles and onboarding models. Build a well defined plan for every innovation project. Many innovation pilots are “successful” during the pilot phase, but fail during the scaling phase. This is because the pilots were not fully thought out at the start. Some test a specific technology or solution, and not the approaches. Others test the wrong things (or not enough of the right things). Some are tested in conditions that are not truly reflective of the environment it will be deployed into. Still others don’t test extensively enough, or over a sufficient range of conditions. Successful projects in smart city innovation labs involve extensive planning, cross-department collaboration, and a comprehensive review process throughout its lifecycle. They have well defined problem statements. They define a targeted and measurable outcome, a detailed set of test requirements and specific success criteria. While innovation projects contain uncertainty, minimize project execution uncertainties with “tried and true” project management plans and processes. Continuously drive broad support for the lab. A successful civic innovation lab thrives on active support, collaboration and engagement from stakeholders across the civic ecosystem. However, many city departments and agencies operate in silos. Launching and having an innovation lab doesn’t mean that everyone knows about it, actively funnel projects to it, or support and engage with it. Successful smart city innovation labs proactively drive awareness, interest and support from city leaders, agencies, and the community. This includes success stories, progress updates, technology briefings and demonstrations, project solicitations, and trainings. They engage with city and agency leaders regularly, host lab open houses and community tours. They conduct press and social media awareness campaigns. Regardless of the “who, how and what” of the outreach, the key is to do it regularly internally and externally. Measure the things that matter - outcomes. There are many metrics that an innovation lab can be measured on. These range from the number of projects completed, organizations engaged, number of partnerships, investments and expenses, and so on. Ultimately, the only innovation lab metric that truly matters is to be able to answer the following question - “what real world difference has the lab made that justifies its continuing existence and funding?”. All innovation lab projects focus on solving the problem at hand. It must quantify the impact of any solutions created. For example, many cities are monitoring air quality. A people counting sensor, mounted alongside an air quality sensor, quantifies the number of people impacted. Any corrective measures developed as a result of this project can now point to a quantifiable outcome. Build an innovation partner ecosystem. A smart city innovation lab cannot address the city’s innovation needs by itself. A city is a complex ecosystem comprising multiple and diverse domains. Technologies are emerging and evolving rapidly. New digital skills, from software programming to data science, are required to build and operate the new smart city. Successful smart city innovation labs complement their internal capabilities and resources by building an ecosystem of strategic and specialist partners and solutions providers, and subject matter experts. These partners are identified ahead of time, onboarded and then brought in on an as-needed basis to support projects and activities as needed. This model requires the lab to build strong partnership competence, processes, policies and the appropriate contract vehicles. In addition, the lab must continuously scan the innovation ecosystem, identify and recruit new partners ahead of the need. Test approaches, not vendors or solutions. Real world city problems are complex. There is no magic “one size fits all” solution. For example, smart parking systems use sensor based and camera based approaches. In some cases, both approaches work equally well. In other cases, one or the other will work better. A common innovation mistake is to only test one approach or fall in love with a specific vendor solution and draw a generalized conclusion. Effective innovation lab projects focus on testing various approaches (not vendors) in order to solve problems effectively. Given the rapid pace of technology evolution, take the time to identify, test and characterize the various solution approaches instead. Employ a multi-connectivity smart city strategy. There are many options for smart city connectivity. These include, but not limited to cellular 3G/4G, Wi-Fi, LoRaWAN, SigFox, NB-IoT and Bluetooth, and so on. Use cases and solutions are now emerging to support these options. However, some smart city technologies in the marketplace work on one, while others work on more. There is no “one size fits all” connectivity method that works everywhere, every time, with everything. To be effective, smart city innovation labs need to support several of these options. The reality is that there is not enough information to know which options work best for what applications, and when. What works in one city or region, may not work in another. Pilot projects test a possible solution, as well as the connectivity approach to that solution. Make small innovation investments and spread them around. Open an innovation lab and a long line of solutions vendors will show up. Everyone has a potential solution that will solve a particular problem. Some of these solutions may even work. Unfortunately, there is not enough budget to look at every solution and solve every problem. Focus on making smaller, but more investments around several areas. Overinvesting in one vendor or one approach, in a market where technologies are immature and still evolving, is not wise. Invest enough to confirm the pilot outcomes. A more detailed evaluation of the various solutions and vendors should be made when the pilot moves out of the innovation lab and into a formal procurement and RFP phase. Simplify administrative and non-innovation workloads. While innovation pilot projects are challenging, interesting and even fun, administering and managing the projects are not. These unavoidable tasks range include managing inbound requests, proposals and ongoing projects. These tasks increasingly consume time and resources away from the core innovation activities. Effective smart city innovation labs get ahead of this by organizing, simplifying and automating administrative activities right from the start. For example, SMC Labs reviews inbound proposals once a week and organizes follow up calls and meetings on a specific day once every two weeks. In addition, the lab uses a tracking and pilot management tool (Urban Leap) to track innovation projects. Administrative and management activities are unavoidable. However, advanced planning and tools help reduce the burden to keep the lab's focus on innovation. Benson Chan is an innovation catalyst at Strategy of Things, helping cities become smarter and more responsive through its innovation laboratory, research and intelligence, consulting and acceleration (execution) services. He has over 25 years of scaling innovative businesses and bringing innovations to market for Fortune 500 and start-up companies. Benson shares his deep experiences in strategy, business development, marketing, product management, engineering and operations management to help IoTCentral readers address strategic and practical IoT issues.